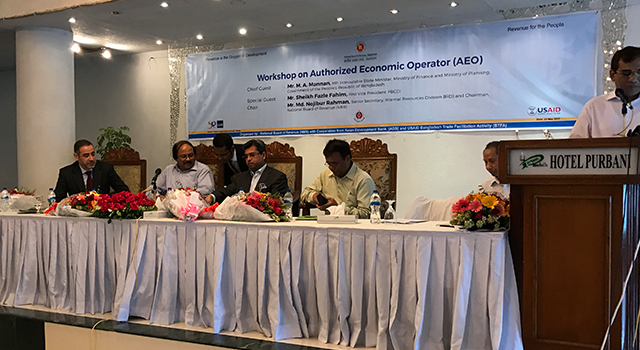 The Bangladesh National Board of Revenue (NBR), the Asian Development Bank (ADB), and the United States Agency for International Development (USAID) held a workshop on the Authorized Economic Operator (AEO) program on 23 May 2017 in Dhaka, Bangladesh, to inform the private sector about benefits of the AEO program. 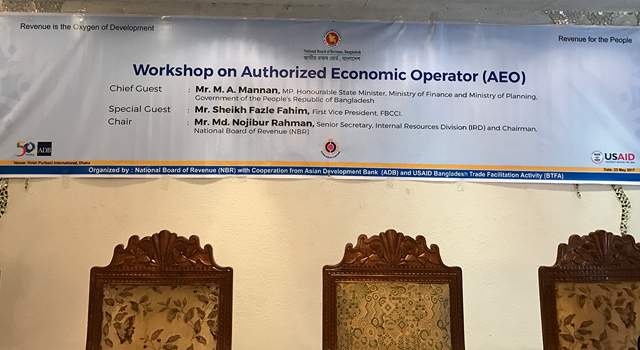 Clarified participants' questions on AEO-related topics, including coordinated border management, procedures to get AEO accreditation, and AEO compliance. 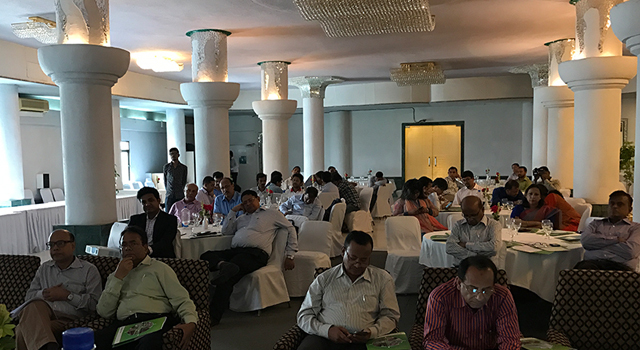 Mr. Md Nojibur Rahman, Chairman, NBR, Bangladesh, chaired the Workshop. In his opening speech, he highlighted NBR efforts to provide businesses with global best practice services to facilitate trade. Businesses that can apply for AEO certification in Bangladesh include those involved in manufacturing, export/import, logistics, port and airport operators, and warehouse operators. Chief guest at the Workshop, Mr. MA Mannan, State Minister, Ministry of Finance, Bangladesh, stressed the need to improve trade facilitation in Bangladesh to encourage further trade expansion. He also underscored the need to keep improving NBR, and that boosting linkages with revenue authorities of other countries will enable them to observe more best practices. 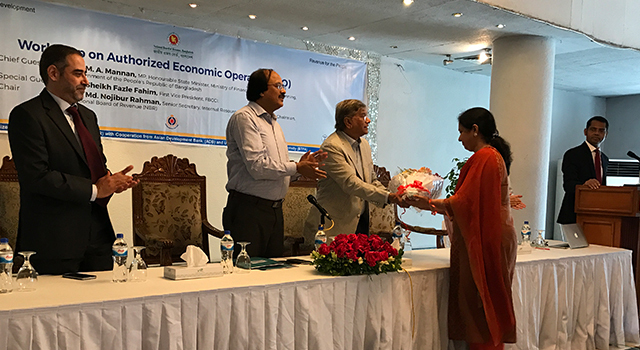 Mr. Sheikh Fazle Fahim, First Vice President, Federation of Bangladesh Chambers of Commerce and Industry, also attended as special guest. Participants included representatives from the private sector; and staff and consultants from NBR, ADB, and USAID. An AEO accredited company maintains a fair supply chain, and is classified as compliant with a low-risk profile. Under the World Trade Organization Trade Facilitation Agreement, AEO accredited companies enjoy preferential treatment in Customs agencies around the world, with benefits including simplified Customs procedures and quick release of shipments.